The three parties signed a Memorandum of Understanding (MoU) at a ceremony today, paving the way for the GRT to be integrated into NTU's transport network. The parties are also exploring the possibility of extending this to JTC's CleanTech Park. The new GRTs will be tested on NTU's campus in a few phases, which will start around the last quarter this year. 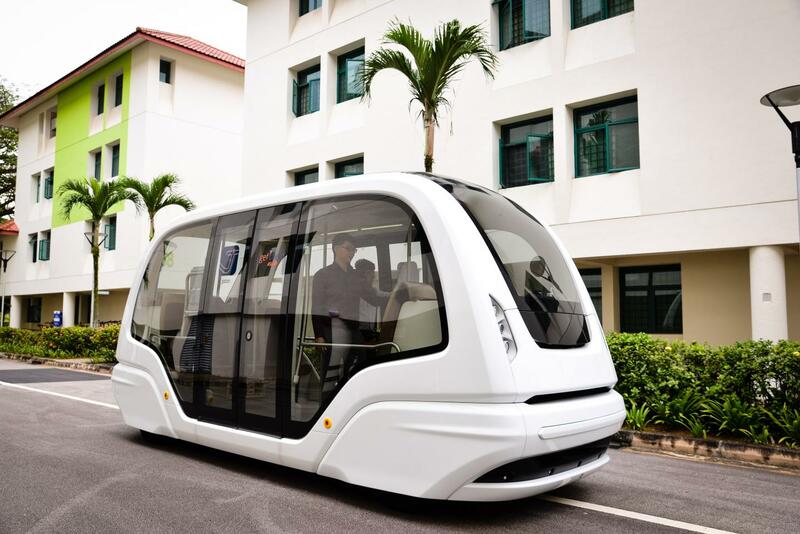 The vehicles are expected to operate a service route that connects NTU's halls of residences with the main academic areas, serving 200 to 300 passengers daily. NTU President Professor Subra Suresh, said, "NTU's campus is not only a living testbed for innovative technologies, but also the first to test driverless vehicles on Singapore roads. Autonomous vehicles are an integral part of the NTU Smart Campus vision, which leverages tech-enabled solutions to create better living and learning experiences. This new collaboration with SMRT and 2getthere highlights our goal of developing cutting-edge transport solutions that will benefit Singapore and beyond." Mr Desmond Kuek, President and Group CEO of SMRT, said, "NTU is a leading research institution in AV technology. SMRT is proud to work with NTU and 2getthere to deploy the first operational AV service in Singapore. This MoU marks the commitment of the three parties in leveraging the latest AV technology for our public transport system and redefine the standard for a world-class transport service." Mr Sjoerd van der Zwaan, Chief Technology Officer of 2getthere, stated, "It is exciting to be able to work together with NTU and SMRT while capitalising on the synergy of an actual AV implementation and investing in research simultaneously. NTU has ample experience with autonomous vehicles and knows exactly what it wants and what it doesn't want – in terms of availability, reliability, quality, safety and AV features such as comfort and user experience. In combination with SMRT's operations expertise, all key ingredients are present to ensure a successful implementation of our AVs at NTU. We look forward to our continued cooperation." The testbed seeks to integrate multiple modes of transport, including shuttle buses, bike sharing systems, e-scooters and e-bikes, and the autonomous GRT into a single mobility platform called jalan-jalan, developed by mobilityX to improve connectivity and travel within NTU's campus and JTC's CleanTech Park in Jurong Innovation District, which will be the largest living lab in Singapore. Jalan-jalan is a Malay term for 'going for a walk'. The smartphone application jalan-jalan received strong support during its pilot run between NTU's campus and JTC's CleanTech Park from last August. Just for e-scooters alone, the app was used to book over 67,000 trips, clocking a total mileage of over 80,000 kilometres. Edward Lim Xun Qian, President of NTU's Students' Union, said, "The app allows a seamless and convenient way to travel around NTU's large campus, right from our halls to our classes. Not only does it help us book Personal Mobility Devices such as e-scooters, the app is also integrated with public and shuttle buses around campus, providing an all-in-one transport solution for students." Colin Lim, mobilityX CEO said, "The NTU and CTP community have a greater range of transport options, and have experienced improved connectivity through innovative first-and-last mile transport solutions like the AV and scooter and bicycle sharing. For example, the utilisation rate of each scooter at approximately 20 trips/day is one of the highest in Singapore." Glory Wee, Director, Aerospace, Marine and Urban Solutions, JTC said, "We are delighted by the positive response from the CleanTech Park community on the trial. Urban solutions, such as Mobility-as-a-Service, help us improve the travel experience of the communities in JTC's estates and lay the foundation for next-generation connectivity and mobility infrastructure in our new estates." Currently serving 16 stops on NTU's campus and the CleanTech Park area, the app will gradually include more stops and manage more mobility options based on users' feedback and test results. SMRT Services actively manages and markets our in-house rail-related Operations & Maintenance (O&M) capabilities, including Automated Fare Collection systems and SMRT Active Route Map Information System (STARiS). SMRT Services also aims to value-add as an integrated transport solutions provider, offering a holistic approach to planning, implementation, operations and maintenance of a customized suite of transport solutions. These can include a range of options covering bike-sharing, shuttle buses, GRT systems and private hire vehicles, centrally managed to meet the various and complex transit needs of commuters today. In 2016, SMRT Services and 2 Getthere Holding B.V. established a Joint Venture (JV) called 2getthere Asia Pte Ltd to market, install, operate and maintain the AV systems for customers in Singapore and the Asia-Pacific. Set up in 1968, JTC is the lead government agency responsible for the development of industrial infrastructure to support and catalyse the growth of industries and enterprises in Singapore. Landmark projects by JTC include the Jurong Industrial Estate; the Jurong Island for energy and chemical industries; business and specialised parks such as the International and Changi Business Parks, Seletar Aerospace Park and Tuas Biomedical Park; a work-live-play-&-learn development called one-north; next generation districts including Jurong Innovation District and the Punggol Digital District, as well as the Jurong Rock Caverns, Southeast Asia's first commercial underground storage facility for liquid hydrocarbons. JTC also develops innovative space such as the JTC Surface Engineering Hub, JTC MedTech Hub, JTC Food Hub @ Senoko, and TimMac @ Kranji which incorporate innovative features and shared infrastructure and services to enable industrialists to start their operations quickly and enhance productivity. 2getthere develops and implements sustainable autonomous passenger transit systems. Our vision is to develop sustainable mobility as the leading supplier of automated passenger transit systems. We realize efficient, high-quality, certified and customized transport solutions, building on more than 25 years of technological developments and experience with several projects all over the world, in diverse and often demanding environments. The systems of 2getthere are unique because they do not require any physical guidance (rails). The outstanding availability, reliability and safety of the systems offer passengers efficient transportation, while clients (airports, developers and local authorities) benefit from lower capital expenses and operational costs. Applications currently in use are the ParkShuttle at the Rivium Business Park in the Netherlands and the PRT system in Masdar City in the United Arab Emirates. 2getthere is a member of the Advanced Transit Association (ATRA) and founding member of its Industry Group. Transit Association (ATRA) established the Industry Group.